1 of 3 Prepare rice according to package directions, about 10 minutes. Drain and place in a medium-size bowl. Stir in salsa and cilantro; set aside. In a small bowl, gently stir together avocado pieces with lime juice; set aside. 2 of 3 Place tortillas on work surface and sprinkle 2 tablespoons cheese in center of each, from left to right. Top cheese with a heaping 1/4 cup black beans. Place a heaping 1/3 cup rice mixture over beans then divide avocado pieces among tortillas. Fold up like an envelope; repeat with remaining tortillas. 3 of 3 Heat a large nonstick skillet over medium-high heat. 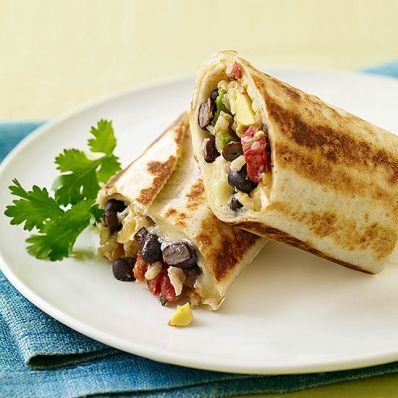 Coat top and bottom of burritos with nonstick cooking spray. Place 3 burritos in skillet, seam-side down; cook for 1 to 2 minutes or until lightly browned and crisp. Turn burritos over and cook another 2 minutes. Repeat with remaining burritos, reducing heat if they get too browned.